You can feel quiet time. We will give you special holiday. At Fuma World Expedition we are proud to have spent the last 16 years exploring the fascinating landscapes and the unique culture of Japanese country; sharing these unforgettable moments with our guests. Join us and explore Japan. Fuma World Expedition provides a unique and unforgettable experience of exploring Japan best kept secret. We are the only motorcycle touring in Japan and high class motorcycle tours. We offer valuable touring, you can see spectacular landscape and Japanese culture, or enjoy Japanese delicious food. 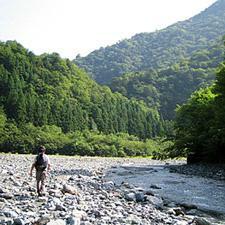 In Naka-gawa runing from Tochigi-prefecture to Ibaragi-prefecture you can enjoy canoe and camping. Going down a famous clear stream Shimanto-gawa in Kochi-prefecture by canoe. We have more fond plans like canoe tour, camping, motorcycle tour in Japan. Please ask us any queries you may have. Copyright (C) OUTDOOR SPACE FUMA. All Rights Reserved.